In the closing hours of Christmas, I was given one last gift. I was fortunate enough to be invited for a last outing for deer to conclude my season. Actually, the invitation to hunt a friends property was a birthday gift for me today. I just filled it a day early. 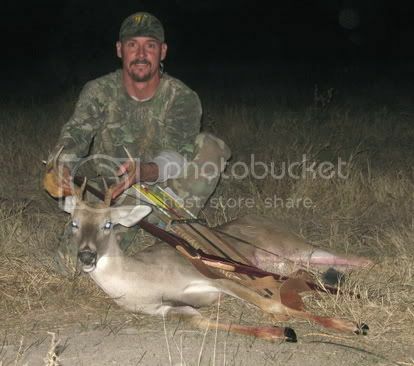 Here is the Bambi buck that will fill my final tag for the year. Shot at 6:00pm on Christmas evening, 12/25/05. Congrats and very nice look'n bow too!